When the Montana Fish and Wildlife Commission meet on April 19 officials will review the final draft of a proposed chronic wasting disease management plan. The new proposal differs from its predecessors in that there will not be a minimum threshold to initiate longterm management actions. Instead protocol will be enacted upon any and all identified cases of the disease. 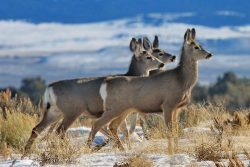 The Montana Fish and Wildlife Commission will review the final draft of the Montana Chronic Wasting Disease Management Plan at its meeting on April 19. Montana found its first case of chronic wasting disease (CWD) in October 2017. CWD is an always-fatal neurologic disease like mad cow disease that affects deer, elk, moose and caribou. There are no known risks to livestock or humans. FWP initiated a CWD Surveillance as part of the Plan in portions of region 3 and region 5 during the 2017 hunting season. In these regions, 1,391 samples were collected from mule deer, white-tailed deer, elk and moose. Six deer (four mule deer bucks, one mule deer doe and one white-tailed doe) tested positive for CWD in region 5 during general season surveillance. No CWD positive animals were detected in region 3. In addition, one radio-collared mule deer buck that was harvested in HD 401 near Chester also tested positive during the general season. In response to the discovery of the disease, FWP held special CWD hunts south of Laurel and north of Chester. During the Bridger Special CWD Hunt, south Laurel, hunters harvested 200 mule deer and 123 white-tailed deer. One additional white-tail and three additional mule deer tested positive for CWD. North of Chester during the Sage Creek Special CWD Hunt, 113 mule deer were harvested, no additional animals tested positive for the disease. The final draft of the plan addresses ideas and concerns presented through a public comment period and also through the work of the internal FWP CWD Action Team and the CWD Citizens Panel. The final plan differs from earlier versions in establishing a threshold to changing management. Earlier drafts of the plan said that FWP may not need to change management if prevalence was less than 5%. However, after reviewing comments from FWP staff and researchers and managers in CWD-positive states, FWP will initiate long-term CWD management actions with any detection, even at low prevalence. The Commission will meet from 8:30 a.m. to 3:30 p.m. on April 19 at FWP Headquarters, 1420 E. Sixth Ave., in Helena.